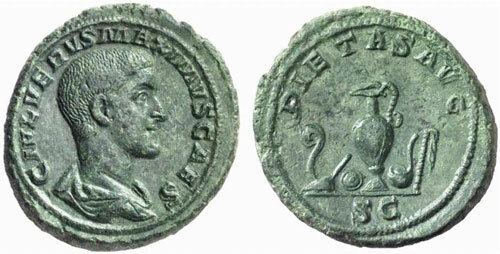 C. Julius Verus Maximus, son of Maximinus was probably given the rank of Caesar at the same time as his father became Augustus. He was murdered with his father near Aquileia on June 24th, 238. Obverse: C IVL VERVS MAXIMVS CAES, Bare-headed and draped bust right. Reverse: PIETAS AVG S C, Jug between lituus, knife and patera to left, simpulum and sprinkler to right. 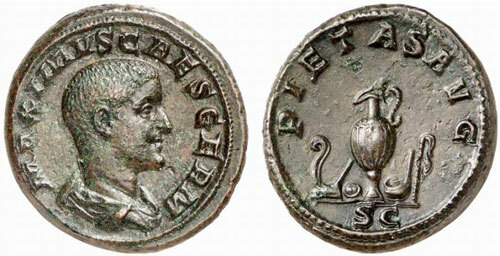 Reverse: PRINCIPI IVVENTVTIS S C, Maximus standing left, holding baton and spear; two signa to right. Obverse: MAXIMVS CAES GERM, Bare-headed and draped bust right.